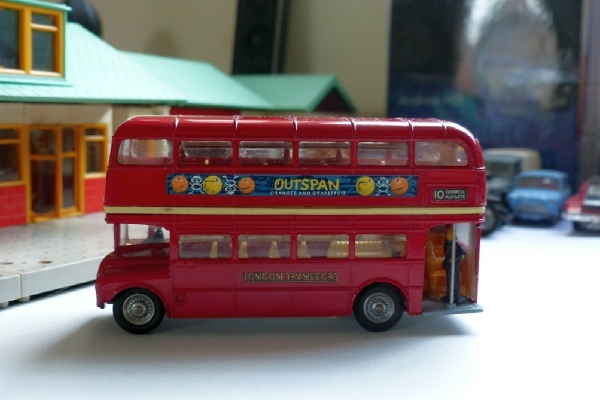 I think every Corgi collection has to have a London bus, even if the scale is rather small. It looks really good on its own! This #468 is a very good model, with a driver a ticket collector, louvred windows, jewelled lights and a nice sold base with suspension. It stayed like that from 1964 to 1971 when Whizzwheels arrived and then in 1975 #469 appeared with none of the above! A rather basic model of which you will find hundreds of variations, some for just a few pounds each even now. These early editions are by far the best and they started with the Corgi decals which switched to Outspan in 1967. There are several others too, most of which did not last very long, as well as on or two special promotion issues (although the vast majority are likely to be the later #469s). Later in its life #468 got cast wheels like this example, which is in superb condition all round, bought for a collector in Germany.